Model making is a hobby for all ages. In Japan, the most prominent genre of models is Gundam models, otherwise known in Japan as Gunpla (GUNdam + PLAstic models). Most model builders usually try to make their creations as realistic as possible, sometimes complete with realistic environments to create fantastic dioramas. Others sometimes go the creative route, mixing genres or creating originals with outlandish concepts. 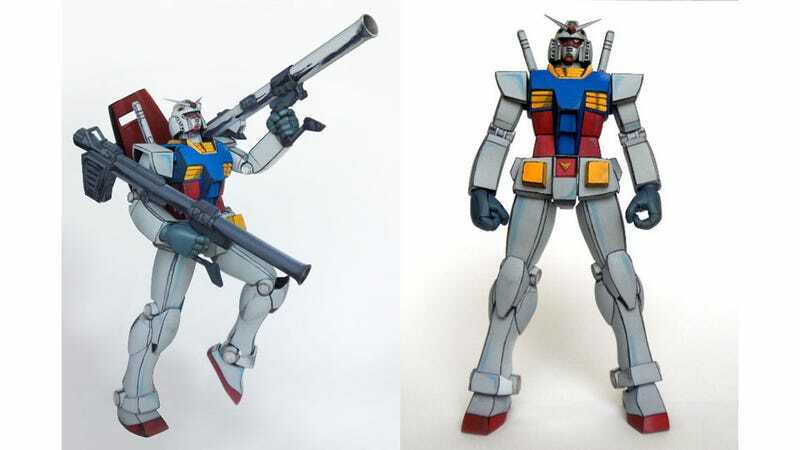 One model builder decided to take the latter option: Customizing a Gundam model to look like something right out of the original anime. The modeler, who goes by the user name Mumumuno53, posted images of his creation to the Figure Community Site fg. The model was customized to look cel shaded and the creator went as far as to make sure the outlines were crooked so as to appear more hand drawn like the 70's anime version of the original Gundam. A 3D model of a 2D anime made to look 2D… a pretty novel concept. This Gundam model was originally an entry in the 13th annual Hobby Japan Orazaku contest, a yearly contest where Gundam modelers all over the country send in their creations to be evaluated and compete. Sadly, while Mumumuno53's entry made it past the first round of judging, it missed getting the bronze medal by only 1 point. Personally, I would have given it the grand prize for its originality alone.